Nothing fancy, just don't like to use big cursors, that's why I have done these cursors and using them for some months now. Think you might have a problem here; I just downloaded it and there are no images. Could just be me. I'll try the "right-click, save target as" and see what happens. I just download it and I didn't find any problem, I guess you don't have any problem too now. after I right-clicked i got the zip with the images and put them into the theme and it works now, nice cursors too BTW! I don't download many cursors, but the other ones usually install themselves. If it worked for you though, it's gotta be just me. This cursor is way nicer, than what it looks like in the picture !! Nice and simple,usually makes the best cursors! Thanks for this one! Since when you are doing cursor xp themes adni ? Looks pretty sweet, we're seeing more cursors in the soon future? Hi adni, This is a nice set. Almost classic with a flair. And the size seems to lend itself nicely to more precise tasks. OH. And speaking of "using for some months". I had your Aurora wallpaper on my desk for quite a while. Sweet. I only changed it about 2 weeks ago when i started longing for some color. Meanwhile ive been looking thru your volumous collection of walls for a suitable replacement. But im gonna end up flipping a coin coz there all pretty awesome. LOL cya round adni and looking forward to more cursors. Hey adni, Thanks for uploading! Nice and clean and easy to use. I like the small size also maybe a new trend?! Really good work. I've always liked your work though, you're a very accomplished author, keep up the good work. Thank you very much Ingui and Radial FX for your kind comments! Excellent work Adni18! The color is indeed Celestial! I love it! I've always loved your work, Adni. It's one of the reasons I visit this site so often. I'm really glad to see you're doing cursors and look forward to future sets. Thanks!! I'm haveing a problem with this new cursor---I can't stop useing it! Thanks again! This is a really nice set of cursors! 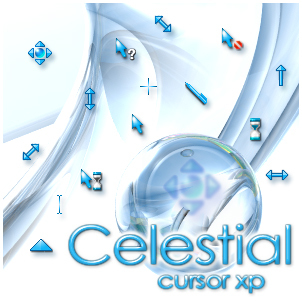 Very nice and simple, elegant cursors.... did I mention that I really like blue?